These click-action logo pens feature a nurse figure on the clip to create the perfect healthcare giveaway! Click-action logo pens with a doctor figure on the clip that make great giveaways for businesses in healthcare! This Mini Wood Baseball Bat Custom Pen is perfect for any baseball or softball fan! Imprinted with your logo, it is sure to be a hit with players and fans alike! This Mini Hockey Stick Custom Pen is great for sports expos. Imprinted with your logo, it is sure to be a hit with players and fans alike! With your company's custom imprint or logo on this rocket shaped ballpoint promotional pen your brand will definately get noticed! No dead giveaway, people will flip over this unique billboard Promotional pen! With your company's custom imprint or logo on this ballpoint promotional pen with race car shape your clients will be racing around their desks to show it off! Celebrate Autumn and Halloween with this unique billboard promotional pen! Bite into a new twist on the imprinted pen. Score a touchdown with this fun football helmet-shaped promotional pencil. An alternative twist on the promotional pen. A logo pencil with real bite!" A healthy twist on the promotional pen. Your marketing strategy is going to grow with this novelty ballpoint green chili pepper shaped custom pen. You will be pleased using this nut & bolt shaped ballpoint customized pen as your advertising "tool" at your next event. 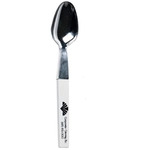 This ballpoint custom pen with a spoon designed cap is the ideal promotional giveaway product. You will be pleased using this wrench shaped ballpoint customized pen as your advertising "tool" at your next event. With your company's custom imprint or logo on this house shaped light up ballpoint custom pen your brand will definately get noticed! This star shaped squeeze top customized pen is two promotional giveaways in one. This ballpoint custom pen with a fork designed cap is the ideal promotional giveaway product. With your company's custom imprint or logo on this lovely Calla Lily shaped ballpoint promotional pen your brand will definately get noticed! Your company's marketing plan will "pop" with success when you give this boxing glove pop top ballpoint custom pen imprinted with your logo. You will be pleased using this caliper shaped ballpoint customized pen as your advertising "tool" at your next event. With your company's custom imprint or logo on this metallic jet shaped ballpoint promotional pen your brand will definately get noticed! Your marketing strategy is going to grow with this ballpoint pea pod shaped custom pen. This football shaped squeeze top customized pen is two promotional giveaways in one. This breast shaped squeeze top customized pen is two promotional giveaways in one. This tennis ball shaped squeeze top customized pen is two promotional giveaways in one. This heart shaped squeeze top customized pen is two promotional giveaways in one. Red Chili pepper ballpoint custom pen will help spice things up for your next promotional event! With your company's custom imprint or logo on this delightful sunflower shaped ballpoint promotional pen your brand will definately get noticed! Your company's marketing plan will "pop" with success when you give this basketball pop top ballpoint custom pen imprinted with your logo. With your company's custom imprint or logo on this frog shaped light up ballpoint custom pen your brand will definately get noticed! Your marketing strategy is going to grow with this fun ballpoint pickle shaped custom pen. Handing out novelty promotional pens is the perfect way to turn heads in your direction. Before you get down to serious business with your customers and clients, remind them of how fun it is to work with you! You’ll be giving away a memorable item that’s both eye-catching and useful. We even carry light-up promotional pens (guaranteed to illuminate your brand in the hands of potential customers)! When your customers and clients use their new novelty promotional pens, they’ll also be advertising for you! Novelty pens are sure to attract attention every time they’re used. Curious onlookers will get a glimpse of your company’s information that’s printed front and center on each novelty pen. ePromos will not only help you pick the perfect parcel of pens, we’ll also customize them with your brand logo, name, address, and phone number. You decide what info to include and where to place it! With our extensive collection of novelty pens, you’ll be sure to find the one that meets your exact needs. Companies working on youth marketing can choose from kid-friendly pens, such as light-up promotional pens with stars and smiley faces, color-changing and mood pens, or even pens that double as bubble dispensers! Are you hosting a themed company party or event? Stock up on pens to match your affair. We’ve got pens in the shape of animals, holiday items (such as jack-o’-lanterns and Christmas trees), social media symbols, flowers and more! Using novelty pens as promotional tools is a good way to increase your visibility. Pens with an extra “oomph” to them are often stored out in the open instead of shoved into the back of the junk drawer. Your new pens will fast become favorites with your customers. Each time they reach for their pen, they’ll be reminded of your company and your commitment to keeping the smile on their faces!